In 1955 my family moved to Iroquois, Ontario. This small town of roughly 1,500 persons is located on the St. Lawrence River between Kingston, Ontario and Montreal, Quebec. I was only six then, but still have some very pleasant memories of that time. We lived there from 1955 to the summer of 1962.My father worked for the Royal Bank of Canada and was receiving a promotion with this move. Previously he had been the Accountant at the branch in Woodstock, New Brunswick. That was where I was born in 1949 along with brother Jim and sister Judi. Dad was going to be the Manager of the Iroquois branch of the bank. When we moved into town the St. Lawrence Seaway project had just begun. This was a major international project involving dredging new channels, building new dams and canals all along the river. This was to allow ocean-going ships to sail all the way to the Lakehead (Fort William and Port Arthur) at the head of Lake Superior. Up to this time these larger ships had to offload cargo at Montreal. There it was transferred to the shallower draft “lakers”. These were smaller ships designed specifically for the narrower, shallower channels and canals of the existing Seaway. This was very expensive and time consuming to say the least. The United States and Canada wanted to open up the interiors of their countries to trade. Ports such as Chicago, Detroit and the Lakehead would be accessible to these larger ships. Anyway I got to see it all first hand. Our first home was on King Street which was the old Highway 2 that ran through southern Ontario. There was no Highway 401 expressway back then. This was a two lane highway that wound through every little town and carried all traffic. This road was right next to the river in Iroquois. The river was relatively wide at this point, about half a mile. We could see easily see New York State on the other side. The nearest large American town was Ogdensburg, New York. Access was via a ferry at Prescott. I remember riding the ferry was always real neat for us kids, especially in winter when the river was covered with ice. Sometimes the ferries had to shut down, but usually the icebreakers keep the river lanes open. The house we lived in was very old. I remember it had a coal burning furnace. Dad used to go down to the basement before bed in the winter and stoke the furnace with extra coal to make the heat last the night. One time we had a rat living down there and Dad had to set a trap to catch it. When he brought the dead rat up hanging from the trap I remember thinking how big it was, but then I was only little myself so it was likely not as big as I remember. Heck I thought it was as big as a large cat. Now the other neat thing about the old town at Iroquois was the old schoolhouse I attended. It had a fire escape from the upper floors consisting of a metal chute, like a large slide, several feet in diameter. Now of course kids being kids, we loved to sneak up to the second floor and when the teachers were occupied with other things, we would joyously slide down into the playground. I started my school career there in grade one. There was no kindergarten or preschool available to me at that time. So off I went at six years of age to school for the first time. This was for all day, although I did get to walk home for lunch. I was so confused and scared the first day I wet my pants because I didn’t know how to ask to use the washroom. Teacher told me emphatically that if I needed to go in the future, I was to please, just put up my hand and leave the room. It was decided by the Seaway Authority that the town of Iroquois would be completely relocated because of a control dam that was to be built on the river. Some towns along the river were partially relocated and others just razed, never to be rebuilt. A new town site was chosen and an architectural competition held to design a new town plan. Included in this plan was a unique thing. The downtown business area would be replaced with a mall. At the time this was a major innovation. The mall in new Iroquois was one of the few in existence once completed. Our family got its very first house to call our own in the new town. I was told many years later that it cost $13,000 dollars. It was three bedroom bungalow with a full basement and garage. When I lived there my parents only allowed us to go around the block on the sidewalks. We made it a big adventure riding our bikes and wagons as if we were a wagon train heading west. On the way around this route one house had a pair of huge weeping willow trees that we loved to play all kinds of adventures on. Summers were hot and long. Those were the days of no cares in the world, other than where the next Kool-Aid or Freshie came from. Later when I got older, around ten or eleven, I was allowed to bike to the mall or all around town. Some of us kids went all over town in the summer to collect bottles, cash them in at the depot, then head to the mall. There we would buy a comic book, a pop, and a couple of popsicles all for about twenty-five cents. Then we happily retreated to the cool shade of a large tree and savored the day reading Batman, Superman or some other superhero’s adventures. This is the working title of a writing project I am absorbed in at the moment. I intend to publish a book about this relatively unknown incident. Sure I know I am an unpublished author, but I think this project has great potential. Anything related to Kennedy seems to be of great interest to the general public. 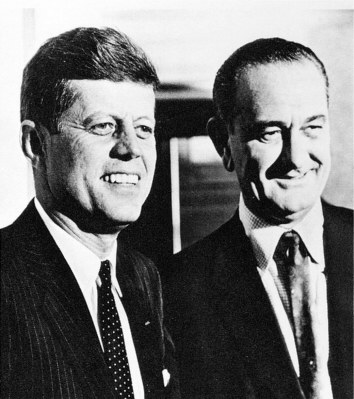 The photo shows President-elect Kennedy and his vice-president-elect Lyndon Johnson.Several short magazine articles have been written on this incident, but most just scratch the surface of the people and events. There has never been a book written or published related to this incident. I have seized the opportunity and am researching and writing a manuscript right now.I have a collaborator in the Belmont New Hampshire Historical Society, who has volunteered to assist with research and interviews. This individual has been generous in providing time and effort towards this project. Acknowledgment will be given. The IncidentIn December 1960 while president-elect John F. Kennedy was at his home in Palm Beach, Florida a retired postal worker from Belmont, New Hampshire, Richard Paul Pavlick, allegedly attempted to kill him. Pavlick was 73 at the time of the attempt.This attempt was suppressed at the time and the media still haven’t paid much attention to it. Pavlick tried to kill Kennedy with a bomb. He supposedly had his body and his car wired with several sticks of dynamite and actually got extremely close to Kennedy. The only thing that held him back was that Kennedy’s wife and children were near and he didn’t want to injure them. I guess even assassins have a conscience. Pavlick was eventually arrested and the evidence against appears to have been overwhelming. However, questions remain. He was never given a trial. Further he was committed and held in various mental institutions for six years without ever having proper legal representation. Eventually a letter was uncovered showing that he had been declared competent and able to stand trial, but had never received one. In fact the government dropped all charges against him. As a result of a hearing he was released in 1966.Very little has been published about who Richard Paul Pavlick really was and why he wanted to kill Kennedy. I have used my genealogical research skills to supplement historical documents and his autobiographical writing: An Innocent Man Arrested: Six Years Spent in Hell. This document is very disjointed but does offer much insight into Pavlick. It also contains useful background information about his life. In my book I intend to give a fair and balanced view of Pavlick and the incident. Primary goal will be the truth. Even if he was guilty of attempting to kill Kennedy, he should have received a fair trial.Several important issues related to the American constitutional succession procedures need to be looked at. What really happens if a president-elect is killed or dies before he is sworn in as the President? Remember the election takes place in November, but the winning candidate doesn’t become President until January of the following year. For Kennedy this was November 8, 1960 and he became president on January 20, 1961. Succession in the event of death is not as straight forward as most people believe. Presidents have died or been killed while in office, but never a president in waiting. Most people believe that the vice-president elect would automatically become President. The answers may surprise you. The incandescent light bulb, you know the regular household bulb, has been in use for roughly 125 years. It appears that its demise as the predominant source of lighting is imminent. Replacing it is the compact fluorescent light bulb (CFL) which has been around for roughly 30 years. They were originally promoted as the solution to the energy crisis of the 1970s. Back then they were bulky, expensive and just plain ugly. Consumers just did not like them. Now in 2007 they are much smaller, reasonably attractive looking, and even more efficient. The reason for the renewed interest by governments and environmental groups is that very significant energy savings can be achieved with their use. A groundswell of support is gaining momentum in an effort to ban the regular (incandescent) light bulb and replace it with the CFL. Consumers need to assure themselves that these are safe and friendly to the environment. Governments must have thought this all through if they are implementing this compulsory change, or have they?The Government of Canada has decided to ban the common (incandescent) light bulb by the year 2012. Little thought has been given to the potential environmental and health risks associated with this change. Environmentalists are praising the step, but seem to have ignored a couple of key issues. With every change there is always a downside. Environmental groups tend to forget about the downside sometimes because it is convenient to do so, or because it doesn’t fit with their agenda. I believe that there are definitely pros to this change, but also significant adverse impacts that cannot be ignored. The big advantage of CFLs over incandescent bulbs is the major energy savings available. The basic difference between an incandescent bulb and a CFL is in the amount of light and heat generated. An incandescent bulb is not at all energy efficient. The good old everyday light bulb converts less than 10 percent of the energy it uses into light. The remaining 90 percent is wasted as heat. Where does most of the electricity come from to power these lights? Why usually from dirty, coal-fired generating plants that are one of the biggest sources of greenhouse gas emissions. No wonder the environmentalists and government want to get rid of them. On the other hand a CFL puts out 95 percent light with only 5 percent wasted as heat. 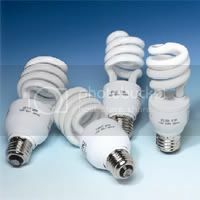 The CFLs also last roughly ten times longer than an incandescent light bulb. This longer life is reduced though it the bulb is turned on and off too often. They are actually more efficient and last longer if left on. According to EnergyStar, an organization that promotes energy efficiency, if every household in the United States made the switch in just one socket, it would be the global warming equivalent of taking 800,000 cars off the road . This adds up to an environmentalist’s dream. The result is an apparently easy way to put a dent in the release of greenhouse gas emissions, the primary “cause” of global warming. CFLs contain mercury. Mercury is a toxic substance that is extremely hazardous to the environment and to health. Proper disposal is imperative. The danger occurs when a CFL breaks. The mercury is then released to the atmosphere. It is harmful if inhaled. However, the amount of mercury in a CFL is very small, about 10 milligrams. To put this in perspective, it is roughly the amount needed to cover the head of a ballpoint pen ball. The amount of mercury in a household thermometer is about 500 milligrams. Mercury is very difficult to cleanup and does not breakdown over time. The impact of the mercury from one bulb is not significant, but if millions of these come into everyday use, the potential impact increases dramatically. Governments, environmental groups, and consumers need to satisfy themselves that an efficient and safe cleanup of a broken bulb is possible. The cumulative effect of the disposal of millions of CFLs into landfills must also be considered. The escape of mercury from landfills to our groundwater aquifers could be catastrophic. Larger corporate users are working on disposal solutions. Hopefully the solutions of the larger users will be transferable to the everyday consumer who only needs to dispose of a few of these bulbs a year. Based on my research, I have decided that I will use the technology, but with certain conditions. First I do not intend to convert my entire house to CFLs. However I will use them in locations where the lights are on almost constantly. For example, I have some high locations above my kitchen away from window light. These seem to be on all the time. I have converted to CFLs here and have been very satisfied with the quality of light. I will not be putting them in any of the children’s bedrooms or in any spots where a breakage would be more likely to occur. I did try putting a 100 watt equivalent in a ceiling pod above my desk. The light intensity was not adequate so I changed back. I recommend trying them out at various places. For anyone who is interested I also have a list of articles available for suggested reading. Just email me directly (see my profile for address) and I will be glad to send it to you. I just have to post on this topic. World War II history is one of my passions. I am totally fascinated by all of it. June 6, 1944 the so-called “Longest Day” was the Allied invasion of Nazi controlled Europe. If the war in Europe was ever to be won, Nazi Germany had to be invaded. D-Day was that invasion. British, Canadian, American and other Allied Forces landed on the coast of Normandy in France. The goal was to establish a beachhead and drive into the heart of Germany to end the war. It succeeded. The war in Europe started in September 1939 and dragged on until May 8, 1945. For 3 years from 1939 until 1944, the Allies hadn’t really made a lot of progress towards attacking Germany directly. They had managed to defeat the German Luffwaffe and ensure air superiority for D-Day. Additionally, they had managed to built Britain into a fortress stocked with arms and troops in preparation for the day when Europe would be invaded. After D-Day, in fact less than one year later, Nazi Germany had been defeated and the European War ended. That was how important the invasion was! If it had failed it might have been many more years before the Allies were able to try again. That is why D-Day is sometimes referred to as the “Turning Point” of the Second World War, at least in Europe. War in the Pacific, well that is another story, it did not end until August 1945. It was a sunny but cool day in the Rockies. I was playing the pristine 18 hole layout at the Golden Golf Club in Golden, British Columbia. Golden is three hours west of Calgary on the Trans-Canada Highway. It is one of my favorite courses. 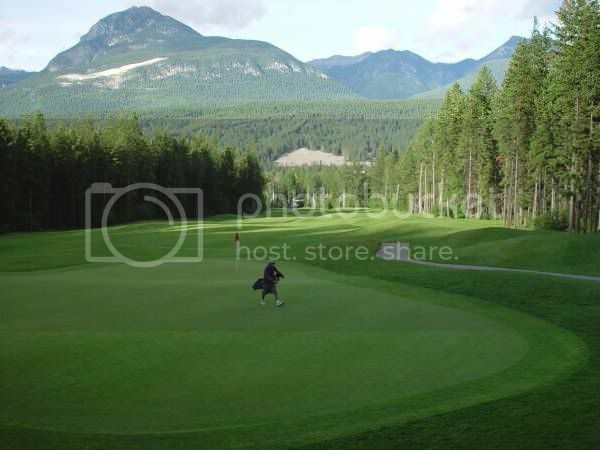 Scenery and fresh air more than make up for any wayward golf shots. It is a wonderful place to experience golf. My golfing ability level is “recreational”, I play well enough to enjoy the game, but not well enough to challenge the pros. Usually I shoot scores in the mid-80s to low 90s. My game can best be described as “flashes of brilliance and moments of despair”. I have been playing since my late teens and am now over 50. Enjoyment of the game is now paramount in my golf goals. This particular day I was playing with two local men I met in the clubhouse. The weather was great for golf, not too cold or hot, with just a whisper of wind. The tenth hole at Golden is a par 4 of 370 yards from the White tees and is uphill all the way from the tee box to the green. The slope of the fairway is more severe in the last 150 yards to the hole. It is relatively straight away with maybe a very slight dogleg right. Hitting my driver off the tee, I sliced into a fairway bunker located 198 yards out on the right. The dreaded slice is one of my weaknesses, as it is for a lot of recreational golfers. Usually I manage to control it. Most of the time it manifests itself as a slight fade. This drive had to be classified as a moderate slice. Approaching the hazard I saw that the ball was in the sand towards the front. The golf ball was sitting up on the white sand. As I scoped out the next shot I noticed the 150 yard marker was just ahead of the bunker. While I was waiting on my playing partners’ shots I walked to the marker and paced the yardage back to the ball. The distance was about 22 yards. This meant the total distance to the center of the green was 172 yards. The top part of the flagstick was visible, but not the green or the hole. My club selection was a number 7 metal fairway wood out of the sand. Ideally this would have enough club loft to get out of the trap. Hopefully I would also be able to advance the ball. I stepped into the trap wriggled my feet around until my stance was solid in the loose sand. I decided to concentrate on the one golf tip that came to my mind – keep your eyes on the sand just behind the ball during the swing. I felt comfortable in my stance, so I took a full swing. At once I realized I had made excellent contact with the ball. The feeling was very sweet as we golfers like to say. The ball streaked out of the sand on a mission. It had good height and was arching directly at the pin. Eyes glued to the flight of the ball, I realized I had hit the ball too well. Surely I thought it would end its flight beyond the target, likely in the rough. Pessimistically, I approached the green and did not see the ball anywhere. Behind the green was an open area covered with long grass. This can be best described as thick, moderate rough. Balls tend to nestle down and become invisible in this type of golf course terrain. I started to look here right away but could not locate the ball. Finally in disgust I gave up the search and sheepishly headed for the flagstick. I wanted help my partners by removing it so they could concentrate on their putts. As I pulled the pin, I looked down and there was my ball! My heart racing with excitement I reached down. Removing it from the hole, I examined it in detail. Sure enough it was my “Ultra 500”. I looked at them, they looked at me. Then my excitement could not be contained anymore. They rushed over to congratulate me as I let out a jubilant cry. I had scored a two on a par 4. This is known as an eagle (two strokes under par). To play this hole and score even a four (par) would be considered outstanding. My golf day was made and I felt like I could do no wrong. Golf was an easy game or so I thought. The next hole was a short but difficult par 4. Confidence exuded from my psyche. With new found prowess the tension I usually felt when approaching the hole evaporated. I proceeded to take six strokes to complete this hole. A double-bogy! The golf gods had sent me a message and shocked me to reality. In the final analysis, what did I care? I had scored an eagle. Very few recreational golfers ever achieve this feat, especially on a golf course of this level of difficulty. For one brief moment I was as good as Tiger Woods. You are currently browsing the WRITINGS & RAMBLINGS blog archives for June, 2007.